Nowadays it’s hard for College Students to hold the pocket money or savings, not more few days. So, they must struggle at the month end without pocket money and savings. But, things have changed now with a lot of work from home opportunities available on the internet. If you're a college-going student and looking to earn money online to improve your personal finance, this article will give you the Top 3 Best Ways to Make Money Online without Investment. Freelancing is the first choice when it comes to making money on the internet and it is considered as one of the best online jobs for students. There are two types of freelancing jobs, where you can apply for freelance jobs or sell services online. To become a freelancer, you must have good skills in some categories like writing, logo designing, translation, marketing, video editing, web development, speaking, proofreading etc. If you have some, you can apply for a job on the freelance sites like Upwork. These freelance sites are open marketplaces which connect the clients to the potential freelancers. These sites will have tons of freelancers looking for the jobs every day. So you got to stand out of the crowd in order to get hired by a client. To attract a client, your profile must be made professional. Add a casual photo of yours on the profile. Explain what you can do and the best part is attaching your portfolio to let the client know about your previous projects. By this way, you can really get hired on the freelance sites and make thousands of dollars every month. If you feel getting hired is a hard job you can sell your professional services on the sites like Fiverr. The Fiverr is an online service marketplace, where anyone can sell or buy online services at low cost. This site is somewhat different from the regular freelancing site where you must apply for jobs. Instead in this site, the clients will approach the sellers and purchase the service if they are satisfied. As a seller, you can attract the potential customers by creating a professional gig. A gig is a face that will tell everything about your service. Add the description to tell what will be the service about and add the necessary images. A gig is said to sell more if you insert an explainer video which should explain about the service. You can earn a minimum of $5 for completing simple projects. As a working student, you can spend few hours every day to earn money online without affecting the studies. Usually, students used to know many languages who used to learn from the small age. Using the language skill in translation work is the easiest job for the students to earn money. There are several online translation sites available on the internet which allows anyone with good translation skills to earn money by completing the translation jobs posted. The translation sites will pay money for every word you translate. The translation pay starts from a cent depending on the language and the skills. To do translation job, you don't have to suffer for finding potential clients and buyers. Everything is automatic here where you can start working once your profile is approved by the translation sites. Every translation site will be very strict when it comes to translation quality. This is done to maintain the integrity of the network. The translators must pass several tests before their account get approved by the team. Once approved, you are going to make some serious money online by spending less than an hour every day. These are the best online jobs for college students to increase their pocket money. They are reliable and genuine so you don't have to worry about the payments. Email marketing is one of the best ways to make money for the students to increase the pocket money by working on part-time. There are two types of email marketing you can do to earn money online. One is by promoting the self-products or promoting the products and services of the third party to earn money by generating sales. The other ways to earn money by doing email marketing is by organizing the email marketing campaign for the clients. This method might give you a fixed monthly income compared to the other methods while there might not be any improvement in the career and the pay. To do email marketing, you must get the mailing list and create an email marketing campaign with the products and services you're going to promote. Then after, use the tools to customize the email campaign and there are ready-made tools available on the email marketing sites which you can make use of to improve the conversions generated by the email marketing campaign. You can manage the email marketing campaign to multiple companies to earn a good income. 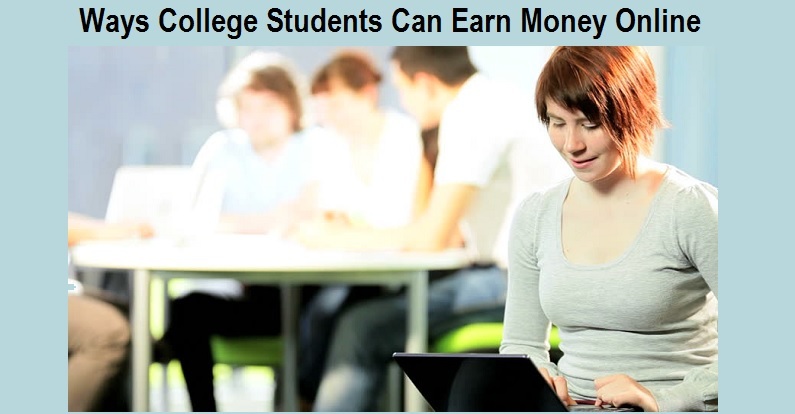 These are the best non-time consuming ways for students to earn money online without affecting regular studies.